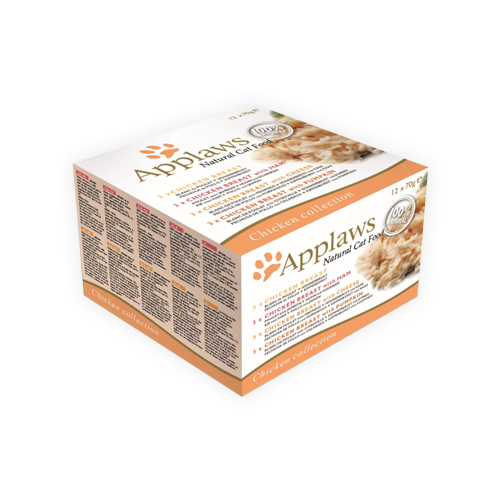 The Applaws Chicken Collection is a collection of four flavours with chicken in one convenient multipack. It contains the following flavours: Chicken Breast, Chicken Breast & Ham, Chicken Breast & Cheese and Chicken Breast & Pumpkin. You will receive 12 tins of 70 grams. Specifically for chicken lovers Applaws has combined four delicious chicken flavours in one convenient multipack. Each tin is packed with natural chicken breast and is supplemented with other ingredients such as ham and pumpkin. This wet food is naturally rich in taurine. This nutrient supports the eye function and is beneficial for the heart. The Applaws Cat Chicken Collection is available in tins of 70 grams. Chicken Breast: Chicken breast (75%), chicken broth (24%) and rice (1%). Chicken Breast & Ham: Chicken breast (75%), chicken broth (19%), ham (5%) and rice (1%). Chicken Breast & Cheese: Chicken breast (70%), boiled water (24%), cheese (5%) and rice (1%). Chicken Breast & Pumpkin: Chicken breast (50%), chicken broth (24%), pumpkin (24%) and rice (1%). Have you used Applaws Cat Food - Chicken Collection before? Let us know what you think about this product.